Right before the automobile industry collapsed and was resurrected by the taxpayers, I bought a Ford. In particular, a Ford Escape Hybrid, which I have the pleasure of still owning. The Escape is a small SUV of the hybrid persuasion. Although less economical than my Prius "daily driver," it serves a number of critical purposes out here in the Land that Has Winter. The most important: Four wheel drive. Also it is sufficiently capacious to carry the occasional furniture item, as well as an excess of mulch, soil, and other bulky items. Its user interface is poorly thought out, but as a vehicle, it's been reliable and I have no major complaints. It does have one problem that is suffered by all vehicles, even the most luxurious and expensive. Every year, it gets a year older. Ford chose yesterday to mark this occasion by sending me an "offer." No, not for an extended warranty. No, not a plea to trade in my "old" car for a new one. No, not a free oil change with every engine replacement. It was for a DVD navigation map update. (I know I'm not very good at "suspense." I'll be working on that.) The offer, dated 09 June 2010 and received on the 17th, stated "The 2011 Ford Map Update is now available!" I am only so credulous; if their map could predict the future, it would be a lot more expensive than the $199 (+$9.99 shipping and handling) offering price! But, sadly, it only predicts the past, since the map data must be somewhat stale and the "2011" is less than fully accurate. My initial reaction was to ignore the offer since the map DVD that came with the car is only two years old and I have yet to be discommoded by an inaccuracy or lacuna. $199? + $9.99 For Shipping? That was my second reaction. What is so special about this DVD? Does it have an embedded sliver of platinum? Are the data bits worth more than 1 or 0? No. Upon rereading the offer, I convinced myself that it's just an ordinary disk, identical except for the bits to the one originally supplied with the car navigation system. Giving myself a reality check, I checked the price of the competition. For example, Garmin charges only $189 for the same data. Except, somehow, they manage to include a complete navigation system, 5-inch LCD, and GPS receiver for $10 less! Why would anyone pay so much for just the DVD? Because, for the same reason that [insert politically incorrect joke here], they have to. Navteq (the navigation map creator) and Ford somehow calculated that this is the proper price, even though the actual marginal cost of the DVD is less than a dollar, and the entire product could be supplied, including shipping, for less than a quarter of their price of shipping alone. Hey, Dudes! These DVDs cost you nothing. Sure, you can sell a tiny handful for a fortune, or a big handful for a few bucks each, but why not give them away? Instead of sending the laughable offer you did, why not send me a letter telling me that I can get a free DVD at my Ford dealer? How much is a visit to a dealer worth in terms of service, sales, customer "mindshare"? How much good will would a free DVD generate for the Ford enterprise? I don't know, but it certainly has to be a lot more than the rip-off suggested in the latest Ford mailer. I stopped at BJ's last night to replenish the truffle supply, and look what I found! Don't recognize it? It's a dedicated WikiPedia! They even offer web updates. Although the manufacturer advertises it for $99, BJ's had boxes of them for $59.99. I couldn't penetrate the plastic fortress to scrutinize them closely, but they probably have a removable 8GB SDC card, so the price for the device itself is correspondingly less. Very close to my take on it! Between the paragraph ending "shipping alone" and the "A Fly on Ford's Wall," well over a month elapsed. 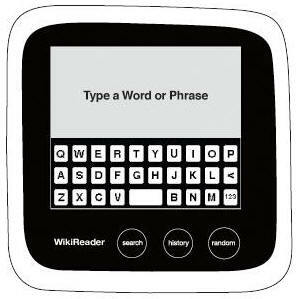 What was your faithful blogger doing during all this time? Not just considering a new material for building fallout shelters, but destroying books to save them! 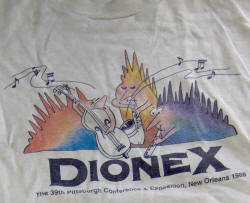 Some T-shirt forensics here: The legend under Dionex reads: "The 39th Pittsburgh Conference & Exposition, New Orleans 1988" If the Pittsburgh Conference was in New Orleans, a city to which I've never been, it means somebody attended the conference and brought me the shirt. I'm easy when it comes to swag.